Children are much more likely than not to grow up in a household in which their parents work, and in nearly half of all two-parent families today, both parents work full time, a sharp increase from previous decades. What hasn’t changed: the difficulty of balancing it all. Working parents say they feel stressed, tired, rushed and short on quality time with their children, friends, partners or hobbies, according to a new Pew Research Center survey. The survey found something of a stress gap by race and education. College-educated parents and white parents were significantly more likely than other parents to say work-family balance is difficult. The data are the latest to show that while family structure seems to have permanently changed, public policy, workplace structure and mores have not seemed to adjust to a norm in which both parents work. She said policies like paid family leave and after-school child care would significantly ease parents’ stress. Yet today, families mostly figure out the juggle on their own. In most cases, that means women still do the majority of the child care and housework — particularly managing the mental checklists of children’s schedules and needs — even when both parents work full time, according to the Pew survey and other research. Just don’t tell fathers that. They are much more likely than mothers to say they share responsibilities equally. Aimee Barnes, 33, and Jakub Zielkiewicz, 31, both work full time at the California Environmental Protection Agency and are the parents of Roman, 15 months. They said they knew they were lucky to have help, like flexible schedules and extended family nearby. Still, figuring out how to manage work and parenting has been hard. That tension is affecting American family life, Pew found. Fifty-six percent of all working parents say the balancing act is difficult, and those who do are more likely to say that parenting is tiring and stressful, and less likely to find it always enjoyable and rewarding. For example, half of those who said the work-family balance was not difficult said parenting was enjoyable all the time, compared with 36 percent of those who said balance was difficult. In a 1989 book called “The Second Shift,” the sociologist Arlie Russell Hochschild described the double burden employed mothers face because they are also responsible for housework and child care. Last year she said that despite some changes in society, the workplace had not changed enough to alleviate the problems. In a book last year, “All Joy and No Fun,” the journalist Jennifer Senior described how little had improved: Working parents face similar stresses, but they are now exacerbated by the expectations of modern parenthood and shared by fathers, too. Of full-time working parents, 39 percent of mothers and 50 percent of fathers say they feel as if they spend too little time with their children. Fifty-nine percent of full-time working mothers say they don’t have enough leisure time, and more than half of working fathers say the same. Of parents with college degrees, 65 percent said they found it difficult to balance job and family; 49 percent of nongraduates said the same. Pew did not investigate why, but one reason might be that professional workers are more likely than hourly workers to be expected to work even after they leave the office. However, they also tend to have more flexibility during the day. The survey also found that white parents were more than 10 percentage points more likely to express stress than nonwhite parents. Historically, white and black mothers have been more likely to work outside the home than Asian and Latina mothers, and foreign-born mothers have been particularly likely to stay home, Pew has found. 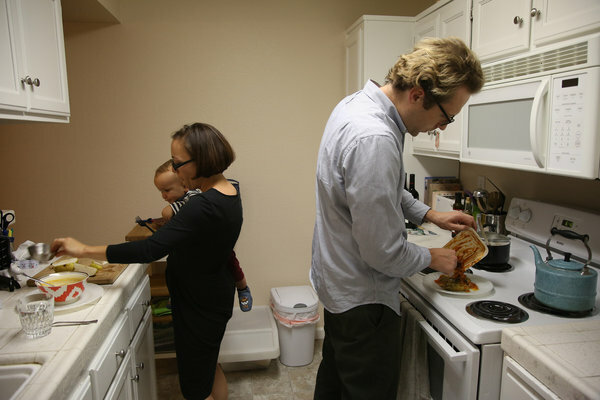 In 46 percent of all two-parent households, both parents work full-time, according to Pew, up from 31 percent in 1970. The share of households with a mother who stays home has declined to 26 percent from 46 percent. Pew surveyed a nationally representative sample of 1,807 parents in every state on both landlines and cellphones. Other data also show that working parents are the new norm. Sixty percent of children now live in households where all the parents at home work at least part time, up from 40 percent in 1965, according to the Bureau of Labor Statistics and the White House Council of Economic Advisers. The shift has economic implications. The median household income for a family in which both parents work full time is $102,400, according to Pew, compared with $84,000 when mothers work part time and $55,000 when they stay home. The data highlight the complicated trade-offs that working families make. Forty-one percent of working mothers said being a parent made it harder to advance in their careers, compared with 20 percent of fathers. Men’s careers took priority more often than women’s did, though the majority said they were equal. Fathers earned more than mothers in half of full-time working families, the same as mothers in about a quarter and less than mothers in a quarter. The ways parents spend their time at home have changed markedly over the years. Government time-use data show that parents over all do less housework and spend more time with their children than they used to. The time men spend on paid work has decreased to 38.5 hours a week from 42 hours in 1965, while the time they spend on housework has doubled to 8.8 hours and the time they spend on child care has tripled to over seven hours. Still, women do much more, especially when it comes to the tasks of raising a child, like managing their schedules and taking care of them when they are sick, according to Pew. Fathers and mothers are much more likely to equally share in doing household chores, disciplining children and playing with them. There is a gender divide in parents’ perceptions of how much responsibility they take on, Pew found. Fifty-six percent of fathers say they share equally, while only 46 percent of mothers agree. “I’d say I do more,” said his wife, Anne Mercogliano, 33, a marketing executive at Twitter. They try to divide child care equally. He wakes up with Fiona and handles the morning routine, and steps in when his wife has a crisis at work. Ms. Mercogliano is what she calls “the advance team” — ordering baby supplies, cooking meals for the week on Sundays and booking pediatrician appointments and swim lessons. Both families said the one policy that would greatly help families like theirs would be paid family leave — particularly paternity leave.